OK, just brainstorming from me … but, perhaps it’ll help! CR (Customer Relationship) Health Chart … how close are our customers to “red lining”? Looks like a disk drive that needs to be defragmented. So, maybe something like a Customer Defrag chart. Maybe something about customer mindshare (If they login each day, they’re thinking about you). Similarly, “customer engagement”. Maybe something about how fast customers are lost (lots of logins at first, then slowly fade away). Or, hey, maybe they start slow and pick-up steam, too! Hey, maybe it’s about customer momentum. I think you’re looking to name the chart and not jus this use of it right? 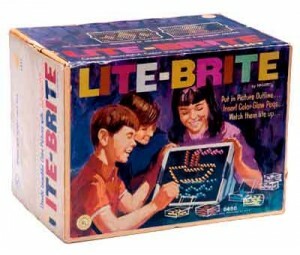 Technically I think it’s a bitmap or bit array: http://en.wikipedia.org/wiki/Bit_array but that can be confusing since people already think of bitmap as a type of image. As a chart it reminds me of a punch card so I would probably name it that. @Paul – yeah, looking for the generic name of this type of chart. So yeah, the on/off or binary or bit nature of it is certainly one part. Each row is almost like a “binary timeline”. Remind me of IBM Punch Cards. 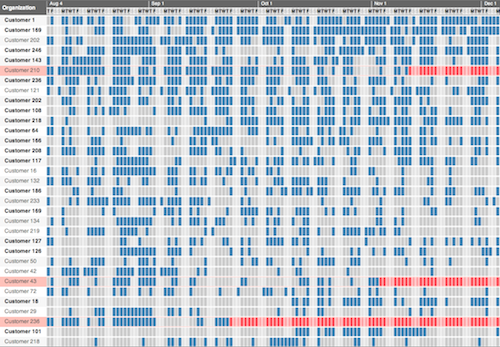 @Dusty – the punch card (especially when actually used as a timesheet) is great, that really matches the visual style of the chart. I may even make one that copies the look of the punch card more exactly. Good find. And again, you could always name it after yourself. There are Gantt charts, how about the McCune Chart. On a more serious note, it kind of reminds me of a SAT score card that you would fill in the ovals. In this case it’s rectangles. Probably not the best analogy, but its the first original thought I could think of. Maybe something simple like Usage Timeline. I totally agree with the punch card thing. Also, remember the Scantron tests we use to take in High School? To me that looks immediately like the images used in Spectroscopy. This image provides an example of what I’m talking about. You have a unified “whole” which is the total spectrum, at the top (ie, this is what it would look like if a given row satisfied every column) and then your actual rows provide an at-a-glance mechanism for displaying which subset of the whole that row represents. 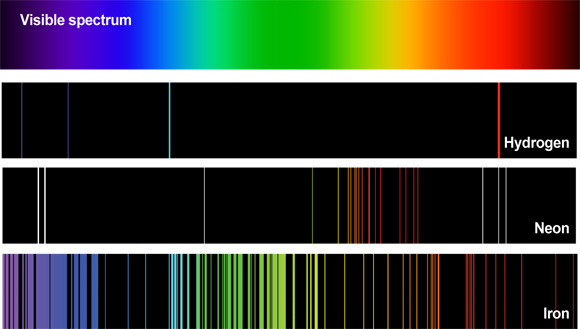 So with that in mind I’d humbly propose naming it a spectral graph or a spectroscopic graph, perhaps? Because you really are fundamentally plotting values against a spectrum, in a way. Anyway, my two cents. Google Image search for “punch card graph” as mentioned by the others brings up similar viz to yours. Think its an appropiate and intuitive name! You’ve created a heat map (http://en.wikipedia.org/wiki/Heat_map). These are used frequently to visualize gene expression data.